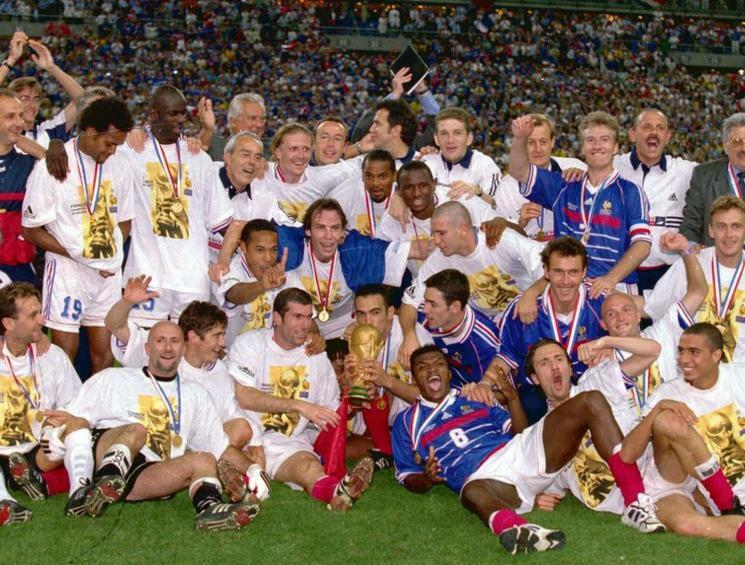 France was awarded the 1998 World Cup on 2 July 1992 by the executive committee of FIFA. They won against Morocco by 12 votes to 7. 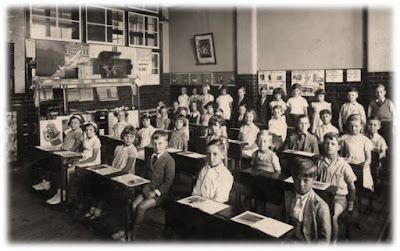 Being the host nation, the French had heaps of pressure on their shoulders to deliver a good World Cup. 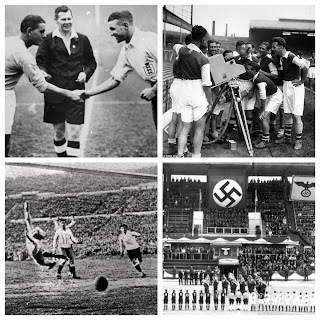 The tournament needed to be well organised and an excellent spectacle for the world. Thankfully, there were numerous highlights and talking points in the 1998 World Cup. A few of people’s favourite goals were Michael Owen burst on to the world stage with his wonderful solo goal against Argentina. Another magical moment came in the opening game of Group D where Nigeria stunned Spain by coming from 2-1 down to win the game 3-2. Sunday Oliseh’s thunderous strike was a goal fit to win any match. Under the sweltering sun in Marseille and late on in a World Cup quarter final you wouldn’t be wrong thinking that both body and mind were tiring. However, this was not the case for Dennis Bergkamp as he showed why he was one of the best strikers to have played the game with his controlled and composed finish against Argentina. A negative from England’s perspective was David Beckham’s red card against Argentina, which people blamed heavily for England’s exit. There were unsavoury images all around the country afterwards as people vilified Beckham for the defeat. It was also important that France had a successful World Cup campaign. 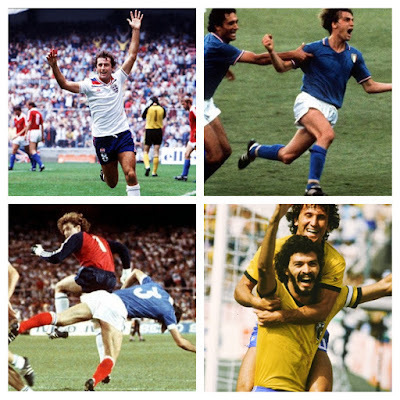 They had before managed to finish 3rd in the 1958 and 1986 World Cups and also came 4th in the 1982 World Cup. The French needed to at least match these previous results in order to maintain interest from the host fans who were not as football-mad as some countries. Luckily for France they had one of the best teams going. Littered with a whole range of stellar names they impressed and performed, going all the way to the final and in fact winning! Fabian Barthez, the somewhat erratic but equally brilliant goalkeeper was solid at the back conceding just two goals in the whole competition. For his performances he picked up the Yashin Award or the Golden Glove as it is now known. The French defence of were strong and commanding, aiding the low goals against tally. The regular foursome of Lilian Thuram. Marcel Desailly, Laurent Blanc and Bixente Lizarazu were outstanding. The defenders also contributed to the French goals for total with Thuram, Blanc and Lizarazu all scoring. Right back Lilian Thuram in particular was a star for the team, scoring two vital goals in the 2-1 semi final versus Croatia. He won the Bronze Ball finishing as the third best player in the tournament. Even Frank Lebœuf, who stepped in for a suspended Laurent Blanc in the final, was flawless and helped to stop Brazil scoring. Vincent Candela often fell behind Lizarazu in the squad selection for France but he still played his part as a member of team. He was selected for Les Bleus in the final Group game against Denmark. A midfield that rotated a number of times proved to be key. Bernard Diomède, Robert Pirès and Alain Boghossian played their roles at various points during the campaign. A young Patrick Vieira also got a run out in the final Group match against Denmark and as a substitute in the final. But it was the quartet of Christian Karembeu, Didier Deschamps, Emmanuel Petit, and of course the phenomenal Zinedine Zidane who were imperious throughout. Zidane was just coming to the forefront of his career playing for Juventus in Italy he was a hugely influential player for both club and country. Despite his red card in the Group match against Saudi Arabia he went on to help his country to victory. He scored on the biggest stage netting two goals in the World Cup Final and instantly became a hero around France helping massively to clinch the nation’s victory. 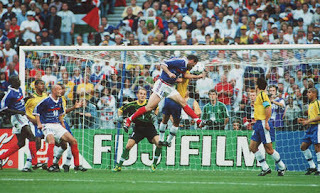 France’s attack included Youri Djorkaeff, Christophe Dugarry and Stéphane Guivarc'h. There were also young and upcoming 20 year olds David Trezeguet and Thierry Henry who scored one goal and three goals respectively during the tournament. The team was celebrated as an important example of the modern multicultural French ideal. Of the 23 players on the team, the squad included players who could trace their roots to Armenia, Algeria, Guadeloupe, New Caledonia, Argentina, Ghana, Senegal, Italy, French Guyana, Portugal and Martinique. France qualified from the Group Stage with maximum points from their three opening games. They cruised the first two games, first beating South Africa 3-0 and secondly Saudi Arabia 4-0. There was a somewhat stiffer test in the last Group match against Denmark. It was in this game France conceded their first goal of the competition, albeit a penalty, but they went on to win the game 2-1 thanks to a second half strike from Emmanuel Petit. Their Group stage success was soured when Zidane was sent off for a stamp on a Saudi Arabian player. He missed the final Group C game against Denmark and also the narrow 1-0 extra time victory over Paraguay. He returned for France’s 4-3 quarter final penalty success against Italy in which he scored the first penalty. 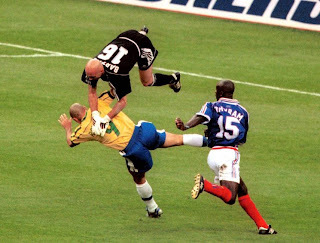 Up next was the semi-final against Croatia and it was time for Lilian Thuram to leave his mark on the tournament. After Davor Suker had opened the by scoring just after half time for the Croatians, Thuram turned the game on its head. He scored a well taken goal a minute after Suker’s and then in the 63rd minute curled a wonderful left footed shot in to the bottom corner of the net. He had given France the ascendancy and they went on to win the match and qualify for the final! Despite Laurent Blanc’s unfair red card leaving a slight dampener come the end of the game, the result called for celebration around the country as French people dared to dream about the possibility of winning their first ever World Cup on home soil. And so, at 2100 local time on 12th July 1998 the World Cup Final kicked off it was Brazil vs France. France stunned the rest of the world brushing aside Brazil 3-0! Zidane scored two nearly identical headed goals from opposite corner kicks to give the host nation a 2-0 lead at half time. The second half was about securing the victory and they kept Brazil at bay. Marcel Desailly was sent off for a second bookable offence meaning ‘Les Bleus’ had to see out the game with 10 men! They managed to do so fairly comfortably and even managed to sneak a third goal as Patrick Vieira sent his Arsenal teammate Emmanuel Petit through on goal to round off an historic victory for a French team that reflected the multi-racial mix of their country. Another shock in the final was Brazilian superstriker Ronaldo. He had provided many memorable moments during the tournament but cut a forlorn figure in the Final against France. He was suffering from the effects of a convulsive fit the night before. However, as Brazil’s main hope he played the match. After initially being left out of the team sheet and in spite of his physical state, 72 minutes before kick-off it was stated that he was going to play. Unfortunately, he collided with the French goalkeeper Fabian Barthez and suffered damage to his already slightly unstable knee. He couldn’t perform to the ability he was capable of. He had an opportunity to reduce the score to 2-1 but missed his chance in the second half. It was a sad day for Brazilian football and also for the footballing world. Following the game, questions were raised whether he should’ve played at all. Despite all this he still received the Golden Ball as player of the tournament. He would later go on to redeem himself scoring 8 goals and picking up the Silver Ball on the way to winning the World Cup with Brazil in the 2002 campaign. For France it was the start of a great few years. They went in to the 2000 European Championships as many people’s favourites. The brilliant Zidane reaching his peak and the young stars of the 1998 World Cup were now turning in to world-class players too. France won the tournament thanks to David Trezeguet’s golden goal in the final against Italy. However, it wasn’t always going to be highs for the French national team. They were brought crashing down to earth in the opening game of the 2002 World Cup against Senegal. They finished the tournament goalless and bottom of the table. It was the worst performance of a defending champion in the history of the tournament! 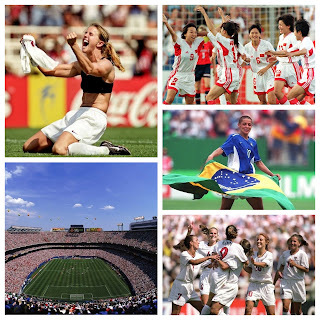 As a whole the 1998 World Cup was a great exhibition for all. The quality of both the football played and the goals scored was outstanding. Headlines were made and stars were born! The success of France at this World Cup must not be forgotten. They had one of the best ever all-round squads, young players and senior players all played their roles. They were the best team and deserved winners on the day. For a nation that wasn’t so football-crazy, there were celebrations all over the country for weeks to come. This quotation from Aimé Jacquet says it all: "There was that great feeling of a shared moment spreading through the public and not just among football fans - the whole of France took to the streets."